Celebrated writer Inua Ellams is renowned for his thought provoking works, creating narratives strongly influenced by his Nigerian roots. 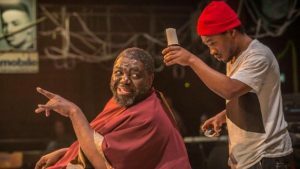 Barbershop Chronicles follows suit, highlighting the significance of Barbershop culture within African culture. Courtesy of The National Theatre. Spanning four countries, Barbershop Chronicles sets to tie the experience of black males together. No matter where abouts you are in the world, the Barbershop holds an incredibly important purpose. On first glance, they can appear insignificant however once you take to your seat, and make your request as to what hairstyle your after, are hubs of debate, discussion, solidarity, inclusion… the list is endless. Beijan Sheibani immerses the audience into a world of Barbershop culture. Billboards up above adorn the Dorfman space, wiring powering these billboards intentionally cascade and are visible to contribute an atmosphere of authenticity, designer Rae Smith creating a encapsulating the vibrant vibe of the African countries these barbershops are situated in. Multiple barber stands are positioned in the round, the audience are no longer inside the Dorfman Theatre, rather in a melting pot of barbershops across the world. Intricate details such as Afro combs and pomeades further immerse the audience. The evening’s hook is its fun use of audience participation during its pre-show. As soon as the audience take their seats, they’ve been greeted by at least a member of the twelve strong cast. This in itself is powerful, it breaks the ice opening up a dialogue between performer and audience. Narratives intertwine, covering themes such as family, politics, religion and relationships. An unspoken camaraderie binds the cast together, no matter the circumstance, there is an unrivalled brotherhood that overcomes any obstacles. It’s a case of the microcosm reflecting that of the microcosm, wider issues effecting daily lives. The ensemble establish such a welcoming atmosphere that the audience are even more willing to find out the stories that lie between these initially jubilant facades. Comedy is the evening’s strong suit, jokes and anecdotes giving way to the more poignant moments. The cast are a joy to watch, each taking on multiple roles and alternate storylines. Transitions in between scenes are just as entertaining as the scenes themselves, dance routines in unison to popular Afrobeat tracks of the moment picking up the pace. Review written by Lucy Basaba.